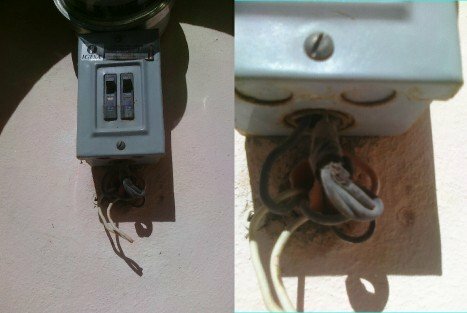 Here are some more interesting electrical installations from Mexico. This is for interests sakes, not for instructional purposes! 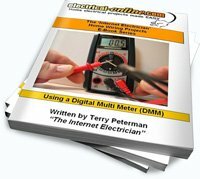 Back in the winter of 2009, I posted an interesting blog entry entitled Mex-Electrical. The post was well received and I had a lot of comments and feedback from readers on the subject. Follow this link to see the archived post. I find it both interesting and entertaining to note some of the electrical installations, and I am always amazed that some of these situations go by with no one really too concerned, and you never see anyone tampering with, nor trying to correct any of these dangerous situations. We are back here in Bucerias, Nayarit, Mexico (just north of Puerto Vallarta), and I am collecting more pictures to share while we are here for the month of February. The hot conductor (a bit hard to see here) entering the bottom of the box has about 1″ of bare wire exposed. The suites that we are staying in this year have some questionable installations, to say the least, and I will show some of these peculiarities in future posts, but as noted by my Brother-in-Law Joel Thompson, this is the first time we haven’t had a convenience outlet in our showers! These service entrances to buildings are typically located about 4 or 5 feet off the ground, and right along the sidewalk lining the streets. A friend of mine found it strange that most of the disconnecting means for the stores or residences are so accessible to the public, and that anyone could shut off the power so easily. This is not so unusual, as it is common practise in many locations to have the service entrance and combination panels located outside the building. So what do you do if you don’t want to have your power shut off either intentionally, or by accident? Duct Tape! The universal solution to most of life’s problems. 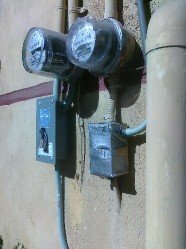 This restaurant owner found that completely taping off your panel with the breaker in the on position not only solved the issue of unexpected power loss, but helped make the panel a little more weatherproof as well! Mexicans are some of the most resourceful people on the planet! This entry was posted in Electrical Wiring, Outdoor Wiring and tagged bare wire, breaker, breaker panel, duct tape, electrical, electrical hazard, electrical panel, electrical service, Mex-electrical. Bookmark the permalink.